Dr. Chandela joined Virginia Neurosurgeons in 2010. He is a board-certified fellowship-trained minimally invasive neurosurgeon who specializes in both cranial and spinal neurosurgery. He is an endovascular neurosurgeon who serves as Director of Neurovascular Surgery at Virginia Hospital Center and his unique expertise in cerebrovascular neurosurgery forms the foundation of the Hospital’s neurovascular and stroke program. In addition, his practice and interests involve minimally-invasive complex spine surgery, general neurosurgery including brain tumors, trigeminal neuralgia and Chiari malformations. Dr. Chandela is one of a few unique dual-trained neurosurgeons nationwide trained in both endovascular and traditional open neurosurgical techniques and was the first one in Northern Virginia to offer microsurgical and endovascular treatment options for cerebrovascular disease. His specialized techniques include microsurgical clipping and endovascular embolization of brain aneurysms, AVM, tumor embolization, spinal angiography, stroke thrombectomy and brain bypass for ischemia. After graduating with honors from medical school at Penn State University, Dr. Chandela completed his neurosurgery residency at Albert Einstein/Montefiore Medical Center in New York City. Subsequently he completed a prestigious fellowship in endovascular/cerebrovascular neurosurgery at Jefferson Hospital for Neuroscience in Philadelphia. He also has special training in brain bypass techniques and skull base surgery during his time in Utrecht, Netherlands. He has trained with world renowned mentors giving him rare expertise in both intracranial and complex spine problems. 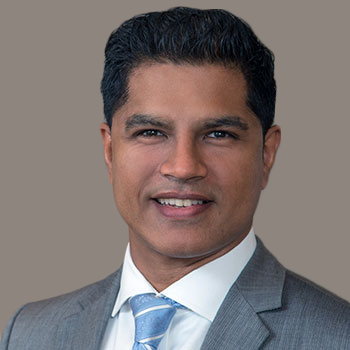 Dr. Chandela is the team neurosurgeon for the Washington Redskins and has served as an independent neurosurgical consultant for the NFL regarding concussion protocols. He has won various research awards, given talks and authored numerous articles in peer reviewed journals. He has been elected as a “top doctor” in Washingtonian and Northern Virginia magazines numerous times. He believes that expertise and skill in brain surgery complements techniques in spine surgery thereby providing patients balanced, conservative and compassionate care.